Review Summary: Arun (Irrfan Khan) and Kuldeep (Arunoday Singh) two gangsters commit the biggest blunder. This is one more solid attempt that takes the graph of Hindi cinema to a greater level. Saali or sane, this Zindagi rocks. 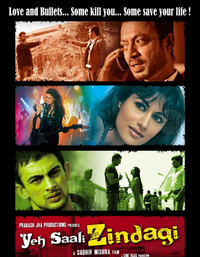 Arun (Irrfan Khan) and Kuldeep (Arunoday Singh) two gangsters commit the biggest blunder. This is a film which he clearly got his teeth into, and in the ever luscious Chitrangada who looks as if she has lived a life in reality and not on paper, he has found the perfect partner in crime. Yeh Saali Zindagi is elementarily a love story filled with chaos and thrill. This is one crazy ride that entertains to the fullest! 'Yeh Saali Zindagi' is the kind of outing that makes you believe that Bollywood indeed has some folks out there who are trying to do things differently when it comes to making films and yet ensuring that commercial elements are well integrated into the storytelling. Also, it is the kind of film that deserves a watch in a theatre because of the sheer experience of enjoying it with a crowd rather than in isolation.